Corpus-based concatenative synthesis (CBCS) is a recent sound synthesis method that is based on descriptor analysis of any number of existing or live-recorded sounds and synthesis by selection of sound segments from the database matching sound characteristics given by the user. While the previous phase of research focused mainly on the analysis and synthesis methods, and handling of the corpus, current research now turns more and more towards how expert musicians, designers, the general public or children can interact efficiently and creatively with a corpus of sounds. We will first look at gestural control of the navigation through the sound space, how it can be controlled by audio input to transform sound in surprising ways, or to transcribe and re-orchestrate environmental sound. Then we will consider its use for live performance, especially in an improvisation setting between an instrumental and a CBCS performer, where recording the corpus live from the instrument creates a stronger and more direct coupling between them. Finally, we will discuss sound installations that open up discovery and interaction with rich sound corpora to the general public and children. Corpus-based concatenative synthesis methods (CBCS) are used more and more often in various contexts of music composition, live performance, audiovisual sound design and installations (Schwarz 2007). They take advantage of the rich and ever larger sound databases available today to assemble sounds by interactive real-time or offline content-based selection and concatenation. Especially when environmental or instrumental recordings or live-recorded audio are used to constitute the corpus, the richness and fine details of the original sounds can be made available for musical expression. CBCS is based on the segmentation and description of the timbral characteristics of the sounds in the corpus, and on their synthesis by selection of sound segments from the database matching sound characteristics given by the user. 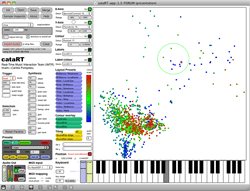 It allows the user to explore a corpus of sounds interactively or by composing paths in the descriptor space, and to recreate novel timbral evolutions. CBCS can also be seen as a content-based extension of granular synthesis, providing direct access to specific sound characteristics. Video 1. Demonstration of using the CataRT interface to perfom basic operations auch as browsing a corpus and importing sounds. YouTube video “cataRT teaser” (1:31) posted by “ircamimtr’s channel” on 19 April 2010. While the research has until recently focused mainly on the analysis and synthesis methods, and handling of the corpus, current research now turns more and more towards how expert musicians, designers, the general public or children can interact efficiently and creatively with a corpus of sounds. The use of CBCS as a new interface for musical expression (NIME) or digital musical instrument (DMI) for use in live performance by expert musicians introduces an important and novel concept that is the essence of the interface — the space of sound characteristics with which the player interacts by navigating through it, with the help of gestural controllers. Corpus-based concatenative synthesis systems build up a database of pre-recorded or live-recorded sound by segmenting it into units, usually of the size of a note, grain, phoneme or beat, and analysing them for a number of sound descriptors, which describe their sonic characteristics. These descriptors are typically pitch, loudness, brilliance, noisiness, spectral shape, etc., or metadata such as instrument class, phoneme label, etc., that are attributed to the units and also include critical information about the segmentation of the units: start time, duration, source sound file index. These sound units are then stored in a database (the corpus). For synthesis, units are selected from the database that are closest to given target values for some of the descriptors, usually in the sense of a weighted Euclidean distance. Video 2 (1:30). Using CataRT for searching drum sounds by the descriptors SpectralCentroid (correlating to brilliance), Periodicity (correlating to noisiness), Loudness (Volume) and SoundSet (audio folder / subdirectory). Ever larger sound databases exist on all of our hard disks and are waiting to be exploited for synthesis, a task that is less and less feasible to do completely manually given this increase in size. Therefore, the help of automated sound description will allow the user to access and exploit a mass of sounds more efficiently and interactively, unlike traditional query-oriented sound databases (Schwarz and Schnell 2009). As with each new synthesis method, corpus-based concatenative synthesis gives rise to new sonorities and new methods to organize and access them, and thus expands the limits of sound art. Here, by selecting snippets of a large database of pre-recorded sound by navigating through a space where each snippet is assigned a place according to its sonic character (Video 2), it allows to explore a corpus of sounds interactively, or by composing this path, and to create novel sound structures by recombining the sound events, proposing novel combinations and evolutions of the source material. The metaphor for composition is an explorative navigation through the sonic landscape of the corpus. Last, using concatenative synthesis, as opposed to pure synthesis from a signal or physical model, allows a composer to exploit the richness of detail of recorded sound while retaining efficient control of the acoustic result by using perceptually and musically meaningful descriptors to specify the desired target sound features. Video 3. Hans Leeuw and Diemo Schwarz improvising at STEIM. An XY control pad is used in first part. YouTube video “Hans&Diemo@STEIM” (12:56) posted by “Hans Leeuw l” on 10 February 2012. The most intuitive access to navigating the corpus is provided by XY controllers, such as MIDI control pads, joystick controllers, etc., for giving the target position in 2D (Video 3). Better still are pressure-sensitive XY controllers such as a graphics tablet, or some rare Tactex-based controllers, that additionally allow for the control of dynamics. Multi-touch controllers or touchscreens, especially when pressure sensitive, are the dream interface for navigation, providing an intuitive polyphonic access to a sound space (Video 4). Motion capture systems, using either cameras and markers or depth-sensing cameras, offer a full-body access to a sound corpus mapped into physical 3D space. These interfaces have not yet been frequently used for music performance, but are beginning to be used in installation settings (Caramiaux et al. 2011, Savary et al. 2013). Accelerometer-equipped devices such as game controllers, smartphones or tablets can be used to navigate the 2D space by tilting and shaking. Examples showing the use of accelerometers built into a device to navigate the corpus can be seen in Video 3 (starting at 4:50). How and when the units close to the target position are actually played is subject to the chosen trigger mode that, together with the control device, finally determines the gestural interaction. There are two classes of trigger modes that give rise to two different styles of musical interaction. We will analyse these two modes according to Cadoz’s framework (Cadoz 1988; Cadoz and Wanderley 2000), which distinguishes three types of gesture: excitation, selection and modification. Video 4 (3:25). CataRT played on a multitouch screen prototype. Excerpt of Diemo Schwarz performing his 2010 work Alarm-Signal (Bonardi et al. 2011). With dynamic instrumental gestures, the specification of the target position can at the same time trigger the playback of the unit. Clearly, here the navigation in the sound space constitutes a selection gesture, and in this group of trigger modes it is at the same time an excitation gesture. The other class of trigger modes separate selection from excitation, giving rise to continuous rhythms or textures. The navigational gestures are solely selection gestures, while no excitation gestures are needed, since the system plays continuously. However, the trigger rate and the granular playback parameters can be controlled by modification gestures on faders. When CBCS is controlled by descriptors analysed from audio input, it can be used to transform sound in surprising ways, for example, to create augmented instruments or to transcribe and re-orchestrate environmental sound (Einbond et al. 2009). This special case of CBCS is generally called audio mosaicing. The ability to map input descriptors to target descriptors is a significant improvement over the control of CBCS using audio spectrum analysis, as in the case of classical audio mosaicing, where the selection is made by direct similarity between input and corpus spectra. Video 5. Using piezo microphones to trigger and navigate the corpus. YouTube video “CataRT controlled by piezo microphones 1” (1:35) posted by “ircamimtr’s channel” on 25 January 2012. In a DMI context, we can make use of piezo pickups on various surfaces that allow the user to hit, scratch and strum the corpus of sound, exploiting its variability according to the gestural interaction, the sound of which is analysed and mapped to the 2D navigation space. This is demonstrated in Video 5: piezo mics are placed beneath the cover of a corrugated plastic folder, and the hands are used to play a corpus of metallic sounds. Dull, soft hitting selects sounds in the lower left corner of the corpus descriptor space where sounds are more dampened or dull, while sharp, hard hitting plays more in the upper right corner, where more edgy and sharp sounds reside. This mode of gestural control in particular often creates a gestural analogy to playing an acoustic instrument, especially in a duo improvisation setting. 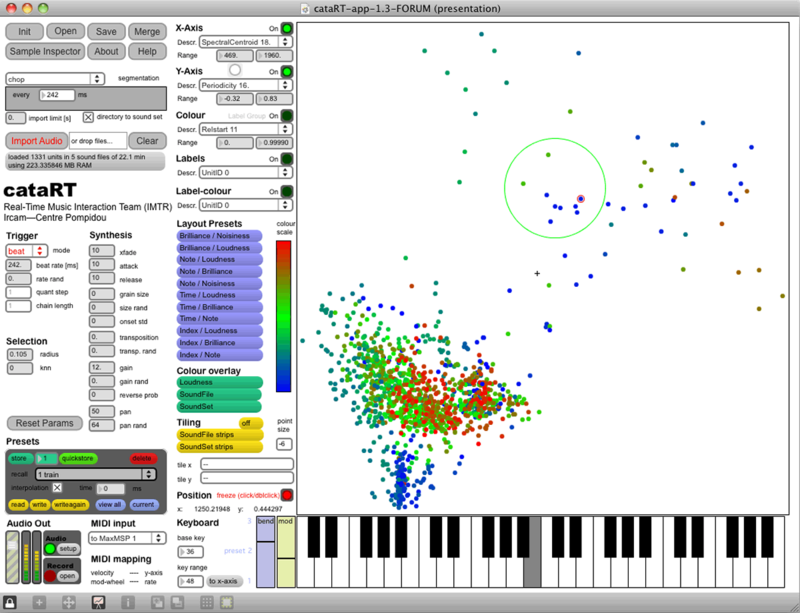 In a compositional context, corpus-based analysis and selection algorithms can be used as a tool for computer-assisted composition. In recent research by Einbond, Schwarz and Bresson (2009), a corpus of audio files was chosen that corresponded to samples of a desired instrumentation. Units from this corpus were then matched to a given target. Instead of triggering audio synthesis, the descriptors corresponding to the selected units and the times at which they are selected were then imported into a compositional environment where they were converted symbolically into a notated score (Video 6) that approximates the target, which could be an audio file, analyzed as above or symbolic: an abstract gesture in descriptor space and time. Video 6 (0:30). An example of corpus-based orchestration of a recording of melting snow for instruments. Excerpt of Aaron Einbond’s What the Blind See (2009), for small ensemble and electronics. For live performance, especially in an improvisation involving both an instrumental and a CBCS performer, recording the corpus live from the acoustic instrument creates a stronger and more direct coupling between the acoustic and the digital performer, compared to improvisation without exchange of sounds. Whereas in the latter the coupling takes place in an abstract space of musical intentions and actions, live CBCS creates a situation in which both performers share the same sound corpus (Audio 1). Thus, the coupling takes place in a concrete sound space, since the very timbral variation of the acoustic performer directly constitutes the instrument from which the digital performer creates music by navigation and recontextualisation (Schwarz and Brunet 2008; Johnson and Schwarz 2011). Audio 1 (4:47). Diemo Schwarz (real-time corpus-based concatenative synthesis software CataRT) and Etienne Brunet (bass clarinet) performing The Concatenator during the Placard Headphone Festival in Paris on 28 October 2007. This setting could even be seen as an improvisation with two brains and four hands controlling one shared symbolic instrument — the sound space — built up from nothing and nourished in unplanned ways by the sound of the acoustic instrument, explored and consumed with whatever the live instant filled it with. It creates a symbiotic relationship between the acoustic and digital performers. This principle of using only sounds provided by the other performer was also employed in the author’s duo performance with Roger Dean at the SI13 conference concert in November 2013. However, the symmetry of two laptop performers suggested that the principle be realised here by a previous two-way exchange of base sound material the performers had been using in their respective solo pieces preceding the duo (Audio 2). Audio 2 (8:34). Roger Dean and Diemo Schwarz performing in duo at the SI13 opening concert on 14 November 2013. Video 7. Interactive corpus-based concatenative synthesis of a wind sound texture in the CataRT system. Vimeo video “Wind texture synthesis using CataRT” (0:36) posted by “Topophonie Group” on 24 July 2011. CBCS also found very promising application in environmental sound texture synthesis (Schwarz and Schnell 2010; Schwarz 2011) for audio-visual production in cinema and games, as well as in sound installations such as the Dirty Tangible Interfaces (DIRTI), which opens up discovery and interaction with rich sound corpora to the general public and children (De Götzen and Serafin 2007). Figure 2. 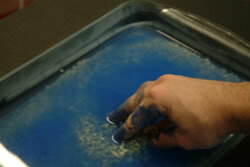 Example of a liquid and granular interaction material (water and ink). Dirty Tangible Interfaces (Savary et al. 2012, 2013) offer a new concept in interface design that forgoes the dogma of repeatability in favour of a richer and more complex experience, constantly evolving, never reversible and infinitely modifiable. In the first realisation of this concept, a granular or liquid interaction material placed in a glass dish (Fig. 2) is tracked for its 3D relief and dynamic changes applied to it by the user(s). The interface allows the user to interact with complex, high-dimensional datasets using a natural gestural palette and with interactions that stimulate the senses. The interaction is tangible and embodied using the full surface of the hands, giving rich tactile feedback through the complex physical properties of the interaction material (Videos 8 and 9). Video 8 (2:50). Demonstration of how DIRTI can be used as musical interface for more than one person, and the effects of different playing techniques on the density and dynamics of the result. Here the corpus is made up of a range of flute and viola sounds representing a variety of techniques. While related work exists that superficially resembles DIRTI — notably SandScape, Relief and Recompose (all three developed at MIT 3[3. More information about and demonstrations of the SandScape, Relief and Recompose are available on the webpages of the MIT-based Tangible Media Group.]) — the guiding principles differ radically. Such interfaces are neither aimed at expressivity nor made for fast, embodied interaction as is needed in musical performance. Further, the precise (re)configuration of the interface is the aim, in contrast to the DIRTI principle of flexibility. Also, they use expensive (laser scanning) or custom-built sensor technology, whereas DIRTI is outfitted with more affordable “hardware” such as commodity webcams and kitchen glassware. The water-based Splash Controller organic UI (Geurts and Abeele 2012) is closer to DIRTI’s concept, detecting the manipulation of water in a gaming context, while Tom Gerhardt’s mud-based design project, the Mud Tub, comes quite close but lacks the multi-dimensionality and musical application. 4[4. For a demonstration of the Mud Tub, see YouTube video “Tom Gerhardt — Mud Tub, Tangible Interface 2009” (4:22) posted by “MediaArtTube” on 19 February 2010.] The only slightly dirty musical interfaces are PebbleBox and CrumbleBag (O’Modhrain and Essl 2004). Those examples of a granular interaction paradigm are based on the analysis of the sounds resulting from the manipulation of physical grains of arbitrary material. This analysis extracts parameters such as grain rate, grain amplitude and grain density, which are then used to control the granulation of sound samples in real time. This approach shows a way of linking the haptic sensation and the control of granular sounds. However, this interface focuses on the interaction sound and does not extract information from the configuration of the material. Video 9. Documentation video showing children experimenting with the DIRTI for iPad to create and control sounds and soundscapes during Les petits chercheurs de sons at Le 104 cultural centre in Paris, 13–16 June 2013. Vimeo video “DIRTI for iPad — ‘Les petits chercheurs de sons’ installation” (2:49) posted by “User Studio” on 24 June 2013. See the Dirty Tangible Interfaces website for more information. While a direct projection of the high-dimensional descriptor space to the low-dimensional navigation space has the advantage of conserving the musically meaningful descriptors as axes (e.g., linear note pitch to the right, rising spectral centroid upwards), we can see in Video 2 (starting around 1:00) that sometimes the navigation space is not optimally exploited, since some regions of it stay empty, while other regions contain a high density of units that are hard to access individually. Especially for the XY controller in a multi-touch setting, a lot of the (expensive and always too small) interaction surface can remain unexploited. Therefore, we apply a distribution algorithm (Lallemand and Schwarz 2011) that spreads the points out using iterative Delaunay triangulation and a mass-spring model (Video 10). Video 10 (1:10). Illustration of the Unispring algorithm (Lallemand and Schwarz 2011). From the variety of examples and usages, we can see that using corpus-based approaches allows composers and musicians to work with an enormous wealth of sounds, while still retaining precise control about their exploitation. From the author’s ongoing experience and observation of various usages we can conclude that CBCS and CataRT can be sonically neutral and transparent, i.e., neither the method nor its software implementation come with a typical sound that is imposed on the musician, but instead, the sound depends mostly on the sonic base material in the corpus and the gestural control of selection, at least when the granular processing tools and transformations are used judiciously. As a DMI, it allows expressive musical play, and to be reactive to co-musicians, especially when using live CBCS. A more general questioning of the concept of the sound space as interface is the antagonism of large variety vs. fine nuances that need to be accommodated by the interface. Indeed, the small physical size of current controllers does not always provide a sufficiently high resolution to precisely exploit fine nuances. Here, prepared sound sets and zooming could help, but finally, maybe less is more: smaller, more homogeneous corpora could encourage more play with the minute details of the sound space. One weakness in the typical interaction setup is that the interface relies on visual feedback to support the navigation in the sound space. This feedback is typically provided on a computer screen that is positioned separate from the gestural controller (except for the multi-touch screens), thus breaking the co-location of information and action. For fixed corpora, this weakness can be circumvented by memorizing the layout and practising with the corpora for a piece, as has been shown in the author’s interpretation of composer Emmanuelle Gibello’s Boucle #1. 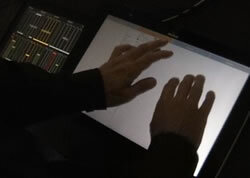 In such cases, the computer screen is hidden from the performer’s view, so that he can base his interpretation solely on the sound, without being distracted by information on the screen, and can thus engage completely with the sound space he creates, and with the audience. For future research and development in efficient interaction with a corpus of sound, application of machine-learning methods seem to be most promising. These could assist in classification of the input gesture in order to make accessible corresponding classes in the corpus, or adaptive mappings between corpora (Stowell and Plumbley 2010) to increase the usability of audio control. More advanced gesture analysis and recognition could lead to more expressivity and definition of different playing styles, and spatial interaction in an installation setting is largely left to explore. Cadoz, Claude. “Instrumental Gesture And Musical Composition.” ICMC 1988. Proceedings of the International Computer Music Conference (Köln, Germany: GMIMIK, 1988), pp. 1–12. Cadoz, Claude and Marcelo M. Wanderley. “Gesture—Music.” Trends in Gestural Control of Music. Edited by Marcelo M. Wanderley and Marc Battier. Paris: Ircam, 2000. Einbond, Aaron, Diemo Schwarz and Jean Bresson. “Corpus-Based Transcription as an Approach to the Compositional Control of Timbre.” ICMC 2009. Proceedings of the International Computer Music Conference (Montréal: McGill University — Schulich School of Music and the Centre for Research in Music Media and Technology [CIRMMT], 16–21 August 2009). Johnson, Victoria and Diemo Schwarz. “Improvising with Corpus-Based Concatenative Synthesis.” In the Proccedings of (Re)thinking Improvisation: International Sessions on Artistic Research in Music (Malmö, Sweden: Malmö Academy of Music, 25–30 November 2011). _____. “Direct and Gestural Interaction with Relief: A 2.5D shape display.” UIST ’11. Proceedings of the 24th ACM Symposium on User Interface Software and Technology (Santa Barbara CA, USA, 16–19 October 2011), pp. 541–548. Schnell, Norbert, Axel Röbel, Diemo Schwarz, Geoffroy Peeters and Riccardo Borghesi. “MuBu & Friends — Assembling tools for content based real-time interactive audio processing in Max/MSP.” ICMC 2009. Proceedings of the International Computer Music Conference (Montréal: McGill University — Schulich School of Music and the Centre for Research in Music Media and Technology [CIRMMT], 16–21 August 2009). Schwarz, Diemo. “Concatenative Sound Synthesis: The early years.” Journal of New Music Research 35/1 (2006) “Audio Mosaicing,” pp. 3–22. _____. “Corpus-Based Concatenative Synthesis.” IEEE Signal Processing Magazine 24/2 (March 2007), pp. 92–104. 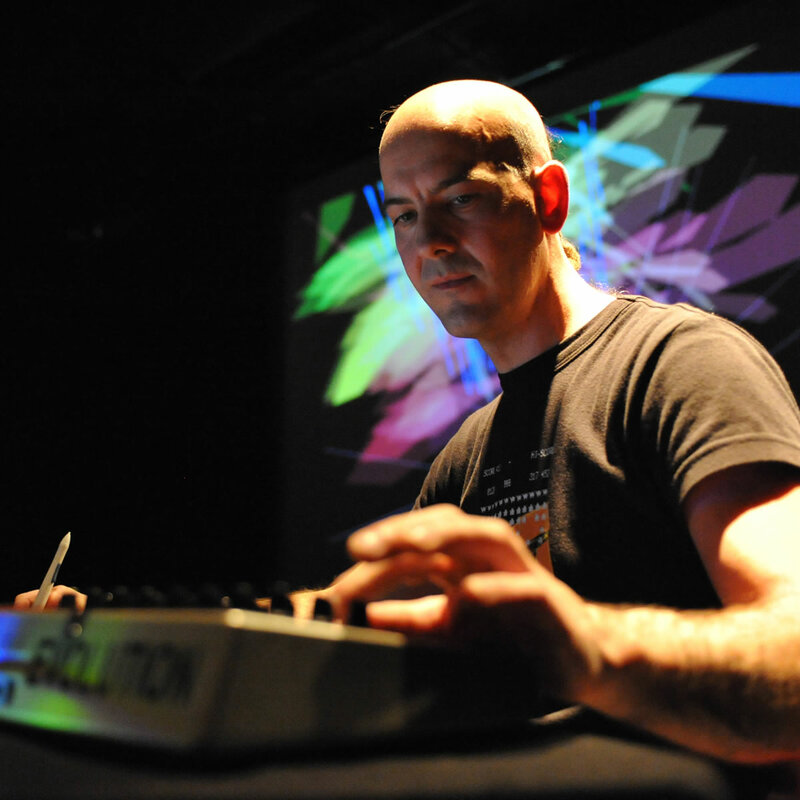 Diemo Schwarz is a researcher and developer in real-time music interaction at Ircam, Paris, composer of electronic music and a musician. His compositions and live performances — under the name of his solo project Mean Time Between Failure, or improvising with musicians such as Fréderic Blondy, Victoria Johnson, Hans Leeuw, Emmanuelle Gibello, George Lewis, Evan Parker, or as member of the ONCEIM improviser ensemble — explore the possibilities of corpus-based concatenative synthesis to re-contextualise any sound source by rearranging audio into a new musical framework using interactive navigation through a timbre space, controlled by gestural input devices. He composes for dance and installations, collaborating with artists such as Franck Leibovici, Cecile Babiole and Christian Delecluse.